When Thomas Alva Edison asks for information, most feel compelled to give it. Not University of Washington professor Benjamin Bradshaw. Not when the question concerns a device conceived in anger and harnessed for murder. Bradshaw hopes the mysterious invention remains lost in Elliott Bay, eluding the search of deep-sea divers. 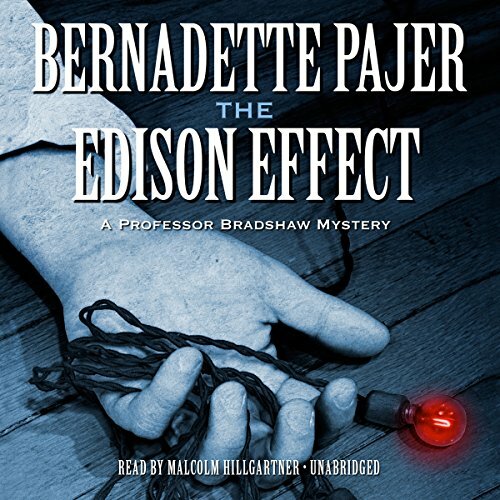 But when, on a cold December morning in1903, an electrician is found dead in the men's wear window of Seattle's Bon Marché clutching a festoon of Edison's holiday lights, Bradshaw suspects a dangerous game has been set in motion. Greed, passion, silence? Motives multiply as the dead man's secrets come to light. Bradshaw and his investigative partner Henry Pratt join Seattle police detective James O'Brien to narrow suspects, but Bradshaw's intuition fails him. His heart is elsewhere, his attention distracted by the dilemma of loving a woman he cannot marry without defying his faith. With Christmas fast approaching, the pressure mounts, as does Bradshaw's dread that this will be his first unsolved case. With no other option, he does the unthinkable and prepares to face his greatest fears. Whatever the outcome, there will be no going back. This is still an enjoyable read but not as good as previous efforts. There was too much time spent criticizing Edison and the Catholic Church. EXCELLENT! WELL WRITTEN AND NARRATED. I totally enjoyed this book. Professor Bradshaw is a good detective. He is skilled in his profession as a professor of engineering as well . I like the plot is intriguing and the pace was fast moving.i like how well Missouri understands him and still love him despite his misgivings and fears. Anyway I am glad that they finally make a decision. I hope there will be more books on this series..